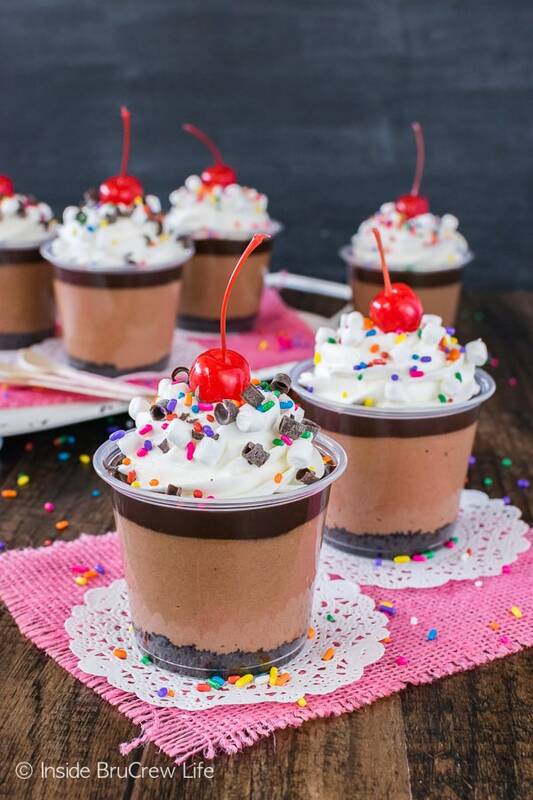 These little No Bake Triple Chocolate Cheesecake Parfaits are an easy treat to keep in the fridge for fun life celebrations. 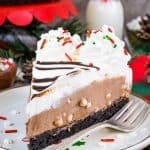 They are also a cute no bake dessert to bring to any party you are headed to this fall. This week we are celebrating all kinds of things. The biggest celebration this week was for our youngest son’s birthday. He has been counting down the days for a few months now. Yes, he was super excited to have a day all about him. That called for a big party day in the middle of the week. He even asked for a pan of these caramel marshmallow M&M brownies as his cake. People, that’s huge. This is the child who insists that he only likes plain brownies. I even double checked before I made them just in case he changed his mind. Then I got to work making a fun stacked brownie cake for him. We usually let the kids pick a place to go for their birthday dinner each year. This year he just wanted a tray of Chick-fil-a nuggets and a pan of three cheese macaroni and cheese at home instead of going out. The day ended with a big game of family Monopoly where I ended up being the first one out. That’s just not my game. Then yesterday I was doing a little happy dance. So, you all know that my hubby and I love to do CrossFit in our garage gym, right? Well, strict pull ups have been something that have been eluding me for years. I can do jump pull ups and assisted pull ups without any problems. But yesterday I got a personal best in pull ups. 4 strict pull ups in a row!!! Of course, I had to let go in between each one, but at least I could just reach up and do the next pull up without any extra jump or motion. I was super pumped about that achievement!!! Then as I was getting ready for the day I saw our 16 year old daughter’s dark blue jean shorts in the clean laundry pile. On a whim I tried them on and then more happy dancing happened. Yup, I can officially wear the teenager’s clothes. LOL! She isn’t as excited about this as I am. And quite honestly, there are some of her clothes that I wouldn’t even attempt to wear because they look good on a 16 year old, not a 41 year old. Last thing that we are celebrating is that my hubby’s health coaching business is starting to grow after a few months of planting those healthy seeds. 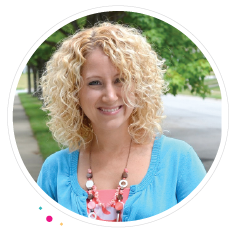 It’s a great program with awesome results, and we are excited to have people reaching out asking how they can reach their goals. I guess we should talk about the little chocolate cups that are sitting in front of you, huh? 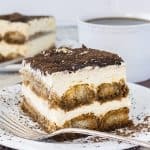 Earlier this year I made these no bake mocha mint cheesecake parfaits and these no bake pina colada cheesecake parfaits for a teacher’s luncheon. What I didn’t tell you is that I made a few other versions too, but I have been holding out on you.I had a good reason! Honest! 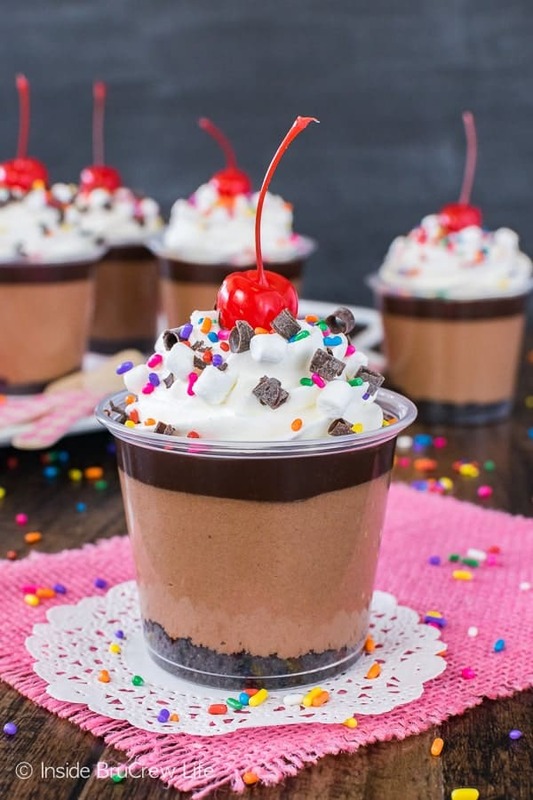 These little no bake triple chocolate cheesecake parfaits are actually a version of this hot chocolate cheesecake dip that went crazy on the blog a few years ago. 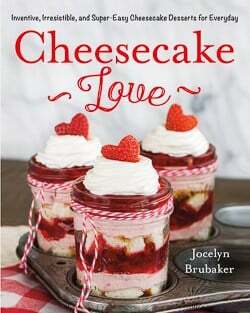 It was so popular that I included it in my new cookbook Cheesecake Love! And there is the last thing we are celebrating this week. Ok, ok, so I’ve been celebrating this achievement since last week. But hey, when you become a published author you celebrate whenever you can. I layered some Oreo cookie crumbs with the chocolate dip, and then topped it off with a spoonful of hot fudge. Three layers of chocolate in every cup is reason enough to celebrate anything! 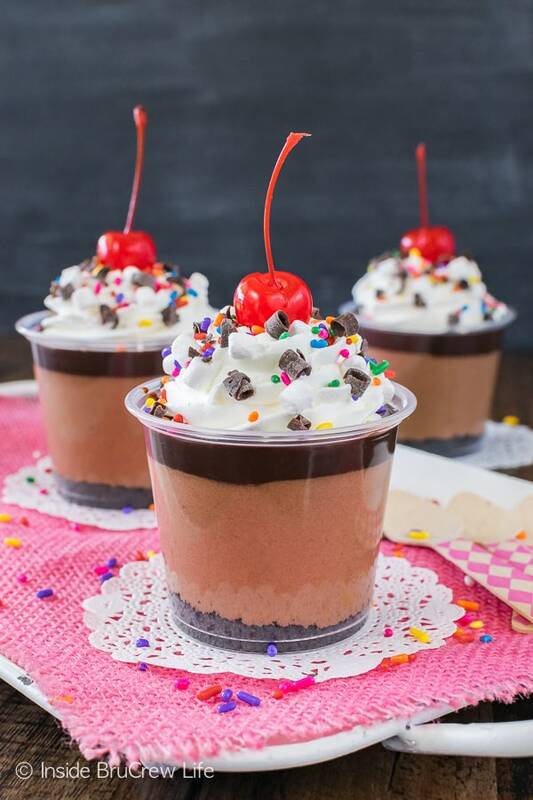 Adding a swirl of whipped cream, sprinkles, and a cherry made these little parfaits a fun treat to share at any celebration. Or make a batch for your fridge and eat one every time you have something fun that needs celebrating! No judgement here! 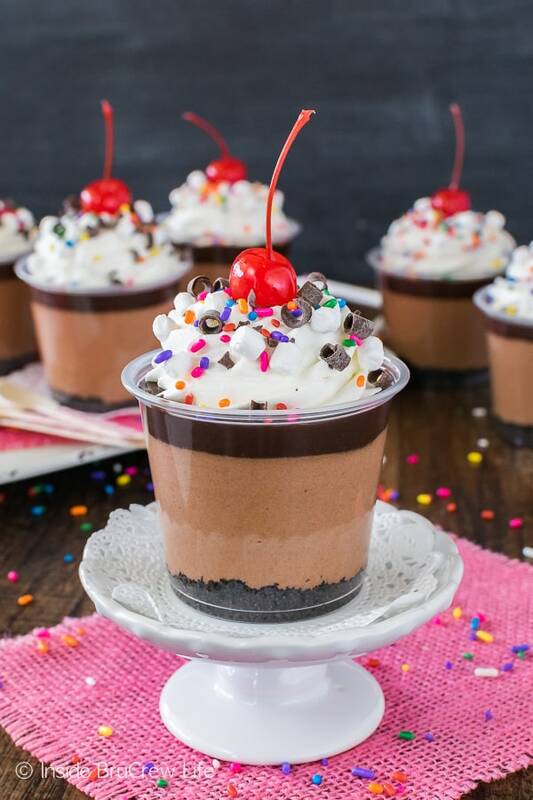 Three layers of chocolate and lots of sprinkles make these little No Bake Triple Chocolate Cheesecake Parfaits a fun treat. 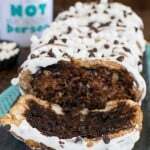 Great dessert to bring to any party or celebration. Place the cookies (filling included) in a food processor. Pulse until crumbs. Divide the crumbs evenly in the bottom of 6 - 5 ounce cups. Beat the cream cheese until creamy. Add the sour cream, marshmallow, and hot chocolate mix and beat again until completely mixed in. Fold in 1/2 cup Cool Whip gently. Spoon the mixture evenly into the cups. Use the back of a spoon to gently level the top smooth. Place the hot fudge in the microwave and heat for 10-15 seconds. Spoon the warm hot fudge on top of the cups. 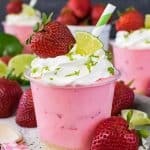 Use a piping bag and icing tip 1M to swirl a little bit of Cool Whip on top of each cup. Sprinkle with sprinkles and top with a cherry. Keep refrigerated. *This post contains an affiliate link. 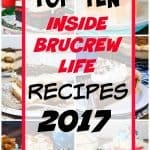 Inside BruCrew Life may receive a small percentage from sales made through these links. As always, these do not cost you any extra. Thank you for letting us share products with you this way. 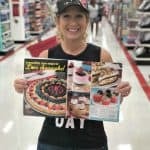 Hi, I followed the link to the marshmallow brownies. How far in advance can they be made and still be at peak flavor and texture? I always hesitate to make recipes topped with marshmallows bc I worry we won’t finish them before the marshmallows get weird! We still have a few on our counter tonight (Fri), and I made them on Tues. They are getting a little bit gooier, but still taste great. I hope that helps. That helps a ton. Thanks! File under “happy food”!!! Awesome.